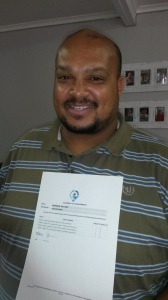 Living Hope can now count itself among the accredited training providers in the Western Cape. Living Hope has received the final stamp of approval from the Services SETA for accreditation of the Way To Work course. This 9-day course teaches the soft skills needed for employment such as work ethic, time management, integrity, communication and more and has been a long-standing programme within Living Hope. The original material was created for training the unemployed in soft skills and has since found a market among employers looking to increase the skills of their staff. What this means for Living Hope is that Way To Work can now be offered in multiple versions both as a resource for the community and an income-generating project as businesses are willing to pay for high quality training, explained Panti. The corporate version piloted with two trainings for the agricultural testing company, Bemlab. To find out when the next Way To Work course will be held or to arrange a training for your company please call Nathan Panti, Programme Coordinator, at 021 784 2838.